The best way to describe this recipe is a custard symphony. 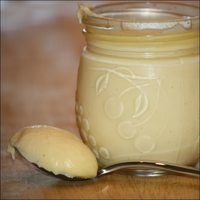 It is truly an absolutely delicious custard recipe. Keep in mind that FA Marzipan is NOT an acceptable sub for FA. The cherry off-note from FA kind of dulls the rest of what this recipe has to offer in my personal experience. If you're patient with steep times, I'd highly recommend this one.